In September 2018 we launched our new Mini and Midi models. Building on the success of our earlier models we developed a new version of the popular Mini desk with some minor tweaks. The legs and feet of the Mini desk have a curved shape at the feet for a smoother design. With the Midi desk comes a plastic bookstand instead of metal to avoid scratches if placing tablets on the stand. We sold out very quickly and looked at improvements for our new model. After receiving feedback from customers we redesigned the Mini desk for 2019. We incorporated the chair already sold with our Sprite desk and a sturdier frame with U shaped supporting bars for extra stability. With no increase in price the extra weight from a sturdier frame means great value for money. Our height adjustable desk and chair sets are great for nurseries and primary schools, particularly where there are mixed age groups. 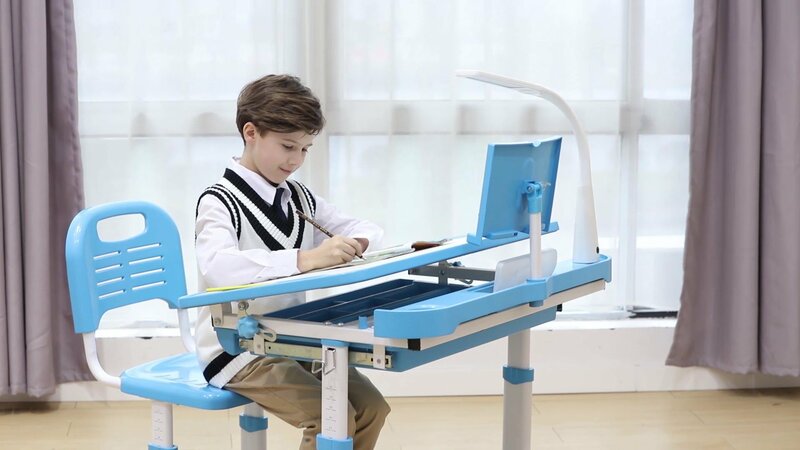 Both desk and chair can be lifted individually to match the child's height. Cube It All, our versatile modular kids storage cube system, allows plenty of space and weight for shoes, coats and bags in a hallway or for books, toys and equipment in the playroom.